Q: Kimi, how is the situation with your back? Are you going to race this weekend? Kimi Raikkonen: If I would not race I would not be here. It would be pointless to come here and be a tourist. Right now it looks promising, so let’s see how it goes tomorrow. Q: Are you getting any treatment? KR: As I said, let’s see how it goes tomorrow. It is not the first time that this occurs – and it will not be the last time. It is something that I’ve dealt with for quite some time and sometimes it gets bad, but most of the time not. I have been racing all these years and sometimes I have to deal with the pain – and the older you get the more you have to deal with such issues. But be assured, I can handle that. Q: How would you rate your drive in Singapore – and your result – given your back issues? KR: On Sunday it was largely fine – the real issue was on Saturday – so I would say that the race result was within our range of results when the tracks suit our car. Q: Have you done some training in between Singapore and Korea? Q: Does the back issue date back to your time with McLaren? KR: It doesn’t matter. It is there and that’s it. Q: Sebastian (Vettel) gave an explanation for his and Red Bull’s success in Singapore, saying that while others are already in leisure mode, hanging at the pool, he and his guys are still working on the car. Can you give a comment on that? KR: Why should I give a comment? KR: Well, everybody has his own view on things. That’s fine with me. Be sure that we work the same amount, but our car is not as fast as theirs so even with the same amount of work we do not achieve the same result. Q: You had great speed in Singapore. Do you think you can beat Red Bull this weekend? KR: We’ve beaten them before and hopefully there will be another chance to beat them later in the year. Sure, they’ve been pretty strong in the last couple of races, but be sure that we will not lessen in our efforts to beat them again. KR: The target is the same as before: we try to do as good as we can and hopefully this will put us in the position to finish on the podium. Sure, I fight for wins. 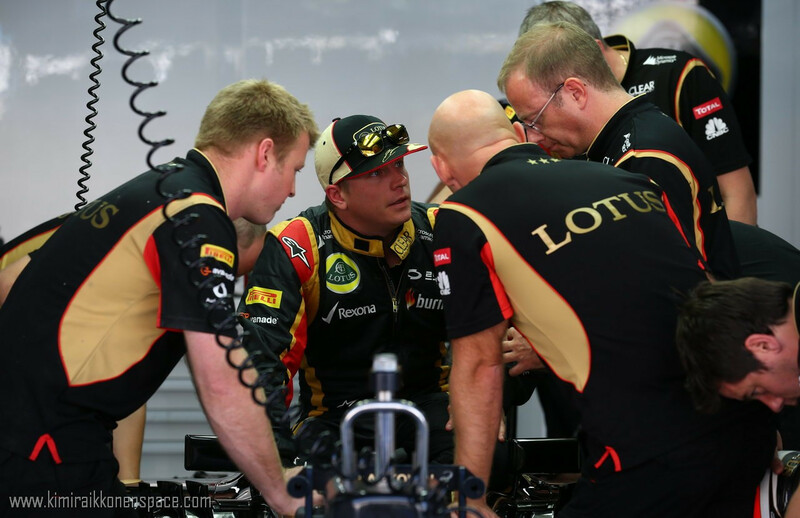 Q: With you leaving Lotus for 2014, it will mean that you are less involved in the development of the car. Is that bad news? KR: It does not change anything for this season, so will not change anything for me. It’s all made up by the media. If there are still new parts coming for this year’s car then I am sure the team will give us both the same treatment. There is no point for the team not to give us both the fastest car that is possible. It is all about getting the maximum for the team. Q: But how is your motivation for these three sets of back-to-back races, in the light of your departure from Lotus? KR: I always try my best and the championship is not decided yet, so before that I will not sit back and do nothing. Q: Do you like this track here? KR: Yes, even though it’s only my second try. But we’ve done well in the last race, so it hopefully also looks promising here.